Paradigm: An example that serves as a pattern or model, or so my American Heritage Dictionary (3rd ed.) states. It’s certainly hard to fault the LCR-450/ADP-150/PS-1000 surround-sound system on any level, so you could do a lot worse than use it as a pattern for others. Furthermore, while the system price of $2145 isn’t exactly inexpensive, I’ve heard $20K surround systems that are much more difficult to listen to; therefore, you could call it a bargain. But don’t hold that against it, okay? Although not THX certified, the Paradigm system resembles a THX system in several particulars. 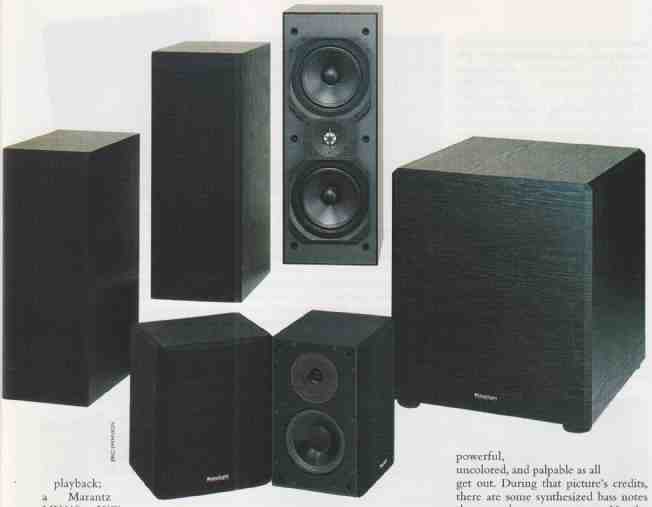 First, all three front-channel speakers are identical, which should help en sure consistency. In addition, the surround speakers are dipolar, just like those in THX certified rigs. This means that sounds are fired to the front and rear of the speakers rather than directly at the listener, which effectively spreads the surround cues through out the room. The LCR-450 loud speakers, used for the right, left, and center channels, are magnetically shielded, which allows the center speaker to be placed horizontally, directly upon the monitor itself. Recommended orientation for the right and left channels is vertical. A full-range design, the LCR-45O0’s 2-dB down point is 70 Hz, but obviously the speaker is capable of producing usable signal much deeper down. This proved to be a tremendous help in aligning the crossover point for the PS-1000 sub-woofer. It also ensured a palpable sense of mass or weight when reproducing big sounds such as helicopters and explosions. The PS-1000 powered subwoofer is extremely flexible, featuring an adjustable phase alignment and an adjustable (50 to 150 Hz) low-pass cutoff frequency. An 18 dB/octave 85 Hz high- pass filtered output is a welcome addition; used between a separate preamp and amp or in conjunction with the pre-out/main-in jacks found on many receivers, the high-pass output frees smaller speakers (and the amplifiers driving them) from onerous low-bass duties, improving a system’s overall dynamic range and efficiency. The 60-liter cabinet sports three tuned ports, making it capable of producing surprising amounts of deep, articulate bass. Is it really capable of cranking out 25 Hz? I couldn’t say, but in films such as Silence of the Lambs, where subsonic information is used to portray pervasive menace, my unease was considerably increased by the deep, powerful rumble that—seemingly—emanated without source through out the room. That’s an effect I have actually heard far more expensive systems render as a low, buzzy sound. The ADP-150 dipoles performed exactly as advertised. Mounted on the wall, with the null spot oriented toward the ear, they threw sound forward and rearward with no localization of individual sounds. While using dipolar speakers is not the only way to accomplish this, it certainly can be an effective one, as it is here. Paradigm supplies mounting hardware, and even pre-drills the ADP-150s to receive it. My video room is 12 feet wide by 10 feet long by 8 feet high. Rotel’s RSP96OAX surround processor drove the speakers via a Rotel RB956AX 6- channel amplifier. A Marantz LV51O laserdisc player spun LDs and CDs, using the Sonic Frontiers Ultrajitter bug and Assemblage DAC 1 for audio playback; a Marantz MV610 HiFi VCR handled videocassette playback. Transparent Cable’s Power Link Reference HPAV line filter and MIT’s ISO-LinQ cable cleaned up incoming signals. The interconnects were Straightwire Symphony; the speaker cables were Straightwire Quartet. Setting up the Paradigm system couldn’t be simpler. The front speakers do require adequate support and should be set up, as the instructions specify; with the center channel resting horizontally, angled up or down toward the listeners, and the left and right speakers standing vertically on either side. It helps, but it is not necessary, if the acoustic center of all three speakers (they are apparent point-sources) is in the same plane. The ADP-150s should be mounted on the wall, above ear-level, and some distance away from the rear wall. 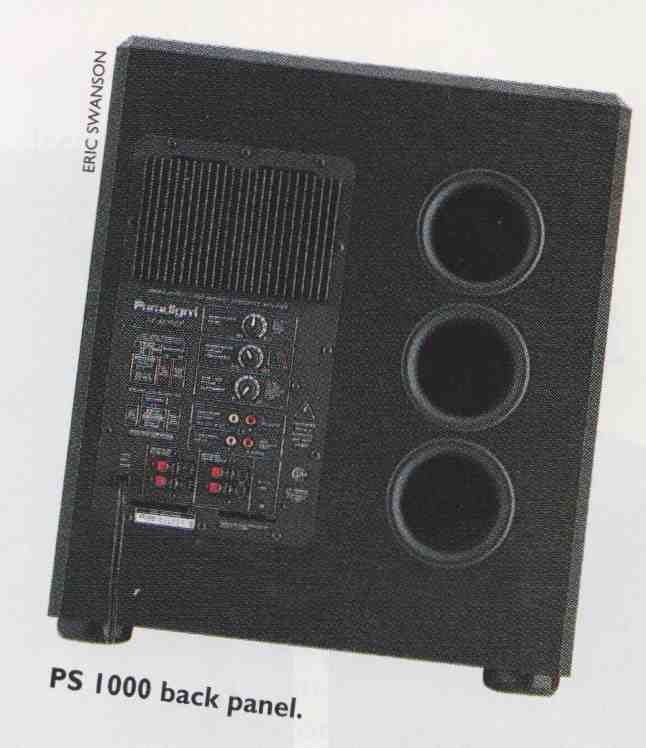 The PS-1000 subwoofer was the shocker; usually subwoofer placement is quite perverse-the more inconvenient the position, the better the integration with the main speakers. However, since the PS-1000 really does woof, and there fore does not require boundary reinforcement, it can be placed well out in the room. Not to mention that the phase alignment and cutoff controls make tuning-in the final integration a snap. I hardly had to play around with placement at all-a first in my experience. I love this system. From the first disc I played, Passenger 57, it came across as uncolored, and palpable as all get out. During that picture's credits, there are some synthesized bass notes that severely tax most systems. Not the Paradigm, however. Rock solid and deep as a chasm, those bass notes came through as I'd never heard them before. Most of the action on this film takes place in a commercial passenger jet, so much of the soundtrack involves deep (and loud) engine noise, rushing air, hydraulic systems engaging-all high-decibel, concrete sounds. The Paradigm delivered it all, while keeping the dialog (such as it is; we're not talking Shakespeare here) comprehensible. I've already mentioned how effective the subsonic tones of Silence of the Lambs were through the Paradigm system. The whole film, in fact, could serve as a textbook on how ambient and highlit sounds can bolster the reality of a theatrical experience. The THX/Criterion edition of the laserdisc is truly impressive, sonically, and Paradigm’s LCR-450/ADP-150/PS- 1000 really delivered the multilayered soundtrack in all of its glory. Films with overlapping layers of dialog, such as those of Jonathan Demme or Robert Altman, were easily comprehensible through the Paradigm system. I suspect that much of the clarity and power that define this system derive from the full frequency response of the front speakers. This certainly adds to the ease of integration with the subwoofer but I think that the LCR-450s also deliver a lot of comprehensible signal that must normally be assigned to a separate woofer. When the fundamental of a sound—or a musical note—is produced in the same location as its overtone structure, the brain does not need to spend any time coordinating the sound(s). Even though very low tones are nondirectional, the separation of sources for tones in the midbass has to profoundly affect comprehension. In our sister publication Stereophile, many of the writers have wrestled with this issue as it pertains to purely musical reproduction—and it must be said that no consensus has been reached. But in a theatrical event where comprehension goes beyond metrical or harmonic structure, one must interpret language as well. This is an enormously complex undertaking—just think about how subtle the difference is between two such similar consonants as p and b. Of course one does not need to comprehend the language involved in a theatrical presentation in order to be moved by it. Kurosawa’s Throne of Blood is recognizably MacBeth, and powerfully acted even if you don’t speak Japanese. But how forceful would it be to a non-Japanese audience if it weren’t based on one of the most recognizable plays in the English language? Still pretty powerful, yet crucial elements would be missing. Surely Kurosawa wanted his audience to know what was going on—as must all directors. Why give up any of the information needed to carry the performance? This is the area in which I feel the Paradigm excelled. Many systems give good explosion, far fewer seem to value the dialog equally. The LCR 450/ADP-150/PS-1000 system never slighted the spectacle, but where it shone was in presenting the elements that take theater out of the merely spectacular and toward the realm of communication. This, to me, is the true heart of the matter. I had problems assessing the performance of the Paradigms in that one sample of the three (serial number 11826) measured-and sounded-very much worse than other two (serial numbers 11821 & '22). Its tweeter featured a 7 dB peak at 3 kHz and dropped rapidly throughout the rest of the treble. In addition, only one of its woofers appeared to be working. The result was a squawky, whistling character to the speakers sound. As WP didn't notice anything amiss in his auditioning of the system, I can only assume that this speaker was damaged in transit to the Stereophile listening room, where I perform my speaker measurements. These measurements therefore apply to the other two speakers, which I assume are representative of Paradigm's production. The LCR 450's B-weighted sensitivity was lower than anticipated, at a calculated 83.5 dB/W/m. (This divergence from the specification is partially explained by the frequency response-see later.) The Paradigm's impedance, however, was benign, dropping to 6 ohms only in the lower midrange and staying above 8 ohms for much of the rest of the audio band. As a result, it shouldn't stress-out inexpensive receivers, The 450's crossover seems to be set quite low, at an estimated 1.6 kHz. Surprisingly, the on-axis response suffers from quite a large suckout about an octave higher. This was apparent on my measurements, as well on those supplied me by Paradigm, made in their new anechoic chamber. This lack of low-treble energy also covered a much wider region on one of the remaining speakers (11821) than the other (11822). This on-axis response significantly affects the measured sensitivity. All things being equal (which, of course, they rarely are), it should also result in a rather uninvolving, distant-sounding balance. I note that WP found the speaker rather "dark-sounding when used to play back stereo music recordings; I imagine this is a result of the measured balance. Above this frequency region, however the Paradigm's tweeter offers a flat, extended response. The 450's bass is well-extended, but will be a little exaggerated in all but large rooms. I am not surprised WP liked this aspect of the speaker's performance. Paradigm's own measurements of the 450's power response, which integrates the on axis response with those off axis, show that this low-treble suckout tends to fill-in off axis, something confirmed by my own measurements, which revealed a well controlled lateral dispersion. Vertically, sitting a little above or a little below the tweeter also helps eliminate the suckout, though if you sit with your ears too far off-axis, the speaker will start to sound hollow in the midrange and bright in the low treble. Both drive-units are connected with the same positive acoustic polarity, though the fiat-baffled design is not time-coherent. The waterfall plot reveals a superbly clean transient decay. Finally, WP did note that he was bothered by something like a cabinet resonance problem. I actually found the 450's enclosure to be relatively resonance-free. The side and back panels did vibrate strongly at 460 Hz, but this is sufficiently high in frequency that its subjective effect should be mild Summing up, assuming that the inconsistencies in measured performance I found were due to accidental damage, the Paradigm LCR 450 appears to offer quite a lot of sound for its price, particularly in the bass. Not surprisingly, I enjoyed playing music through the Paradigm system—at least, those discs recorded in surround sound, such as DMP’s big band disc Carved In Stone (CD-512). These exhibited au expansive soundfield, combined with a satisfying sense of heft on the part of the low brass and double bass. The impact of the luck drum was awesome, on a par with very expensive high-end loudspeakers I’ve tested. I still have a problem with “clumping,” sounds being placed left, center, and tight as opposed to being evenly spread across the front of the room. Perhaps this has to do with the processor I’m using, or the fact that engineers haven’t produced their own paradigm for surround sound, the way they have for two channel—of course, it could also have to do with that large acoustically reflective screen in the middle, too. I was even less satisfied with non-encoded discs played back through the system; here I felt that the tonal balance was much too dark—an effect I seem less likely to forgive in music-only presentations. Listening to the LCR-450s alone in my reference stereo system, I found them surprisingly good for an $800/pair speaker system—although slightly prone to what I take to be cabinet resonance. Still, they sounded musical and essentially harmonically correct. All in all, I was thoroughly impressed with Paradigm’s LCR-450/ADP-150/PS-1000 surround speaker system. I found it simple to set up and enormously satisfying as an audio/video enhancement. It made theater come across both powerfully and comprehensibly. At $2145 it even seems a bargain. I’ve heard systems costing much, much more that were more obtrusive and less articulate. If I’m not wildly enthusiastic about it as a music-only system, this may have more to do with the environment of a home theater, or possibly, our lack of standards in recording multi- channel music discs, than any short coming on its part. It’s a good system, one I don’t want to send back.